Earrings	There are 306 products. 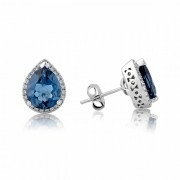 View our range of beautiful silver and gold earrings for women. Further selection available in-store, please contact us if you cannot find what you are looking for. 9ct yellow gold 25mm in diameter hoop earrings with a hinged post. 9ct yellow gold claw set five stone marquise cut cubic zirconia flower stud earrings with a post and scroll fitting. Pair of 18ct white gold claw set round brilliant cut diamond solitaire stud earrings. Total diamond weight 1.40cts. Post and scroll fittings. Also available with 18ct yellow gold backs and in platinum in a variety of diamond weights. Please contact us for details. 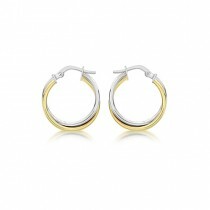 9ct yellow and white gold crossover hoop earrings with a hinged post. 19mm diameter. A pair of 9ct yellow gold 6mm fancy knot stud earrings with scroll and post setting. 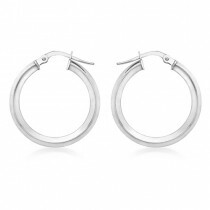 9ct white gold creole design hoop earrings, of plain polished circular section, with hinged post fittings, diameter 21mm. 9ct yellow gold polished and satin finished flower design stud earrings, with post and scroll fittings, diameter 7.5mm. 9ct yellow gold bell drop design stud earrings, with post and scroll fittings, length 8mm. 9ct yellow gold enamelled bumblebee design stud earrings, with post and scroll fittings, measuring 8 x 6mm. 9ct yellow gold tapering filigree design drop earrings, with hook-in wire fittings, measuring 11 x 24mm. 9ct yellow gold enamelled strawberry design stud earrings, with post and scroll fittings, measuring 5 x 6mm. 9ct rose gold creole design hoop earrings, of plain polished D-section, with hinged post fittings, diameter 30mm. 9ct yellow, white and rose gold knot stud earrings, each set with a cultured pearl, with post and scroll fittings, diameter 11mm. Cultured pearl diameter 6mm. 9ct yellow and white gold round swirl design stud earrings, with millegrained and plain polished finish, and post and scroll fittings, diameter 8.3mm. 9ct white gold creole design hoop earrings, of plain polished D-section, with hinged post fittings, diameter 30mm. 9ct yellow gold disc stud design earrings, pavé set with circular cut cubic zirconia, with post and scroll fittings, diameter 7mm. 9ct yellow gold heart shaped stud earrings, pavé set with circular cut cubic zirconia, with post and scroll fittings, measuring 6 x 6mm. 9ct yellow gold pear shaped stud earrings, each bezel set with a pear cut cubic zirconia, with post and scroll fittings, measuring 5 x 7mm. 9ct rose gold drop earrings, each bezel set with two graduated circular cut cubic zirconia, with post and scroll fittings, measuring 5 x 10mm. Cubic Zirconia diameters 4 - 5mm. 9ct yellow gold open pear shaped stud earrings, each accented to one side with an inset circular cut cubic zirconia, with post and scroll fittings, measuring 8 x 12mm. 9ct yellow gold round shaped stud earrings, each claw set with a circular cut cubic zirconia, with post and scroll fittings, diameter 7mm. 9ct white gold floral cluster stud earrings, each claw set with six circular cut cubic zirconia, with post and scroll fittings, measuring 8 x 8mm.